It’s all-go in the MOBAs at the moment, and Heroes of the Storm isn’t to be left out. The latest patch is massive, adding a new hero and map but also implementing fundamental changes to the way the game is played through hero bans. These allow those playing in the ranked mode to create a more competitive, professional-like game to test their skills, and should help with balancing too. There’s also the usual laundry list of balance tweaks, bug fixes and everything you expect. Like playing with your friends? Here’s the best co-op games. Taking the spotlight, as always, is the new hero. 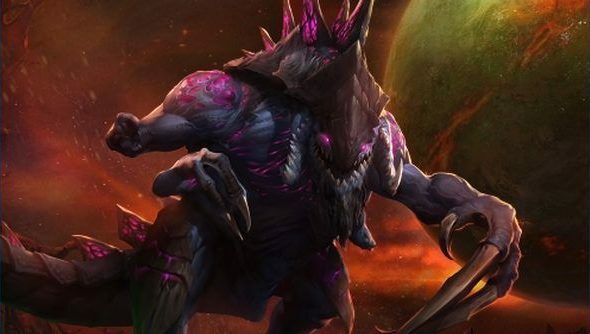 Dehaka hails from Heart of the Swarm, one of Kerrigan’s recruited lieutenants from the Zerg original homeworld of Zerus, and I’ll just embed the video here before I go down a lore hole nobody is interested in. I’m particularly intrigued by his long-range movement ability, Brushstalker. That sort of map-wide teleport is the kind of thing that would normally be restricted to an ultimate in other games. Even with a decent cooldown, it’s ludicrously powerful – but the team-fight structure of HotS means you’re unlikely to be able to exploit it as much as in other games. You’ll either have an ineffective 1v1 with Dahaka’s low damage output, or get ganked. In close engagements though, it could prove a decider to arrive right on time, and its power as an escape shouldn’t be underestimated. Honestly it’s fairly strange this isn’t a feature the game launched with, or at least get sooner, but Blizzard are nothing if not slow and steady. They wanted to get it right, and as Browder says they’re still not in Season 1 of their ranked play. As for the full details of the patch, you can read them on Bnet. There were some fairly significant redesigns to certain heroes, and the beginnings of big changes to talents to make them less cookie-cutter, more focused on counter-picking enemies.